The Fall 2011 edition of The California Nugget has been sent to the printer and should begin arriving in members' mailboxes next week. It's another information-filled issue by Editor Jane Hufft and Production Editor Lois Elling. This issue of the California Nugget is arriving in your mailbox earlier than usual so we can share exciting news about two events. First, the California Genealogical Society proudly announces the publication of the newly revised Raking The Ashes, Genealogical Strategies for pre-1906 San Francisco Research. This new second edition is the finest tool available for conducting genealogical and historical research in San Francisco in the years before the great earthquake. No one knows more about work-around strategies to find cemeteries, records, repositories, unique sources, church information, land records and other genealogical and historical records related to San Francisco than author Nancy Peterson. Completely updated, painstakingly researched, carefully organized and thoroughly user-friendly, Raking the Ashes, second edition, belongs on the shelf of every California researcher. For more information and ordering information, please see page 17. There’s more! CGS and Ancestry.com are bringing a special all-day genealogy con- ference to San Francisco on Saturday, November 5. This informative day will offer many workshops and lectures. If you can be in the area, plan on joining us. Registration information is on page 16. 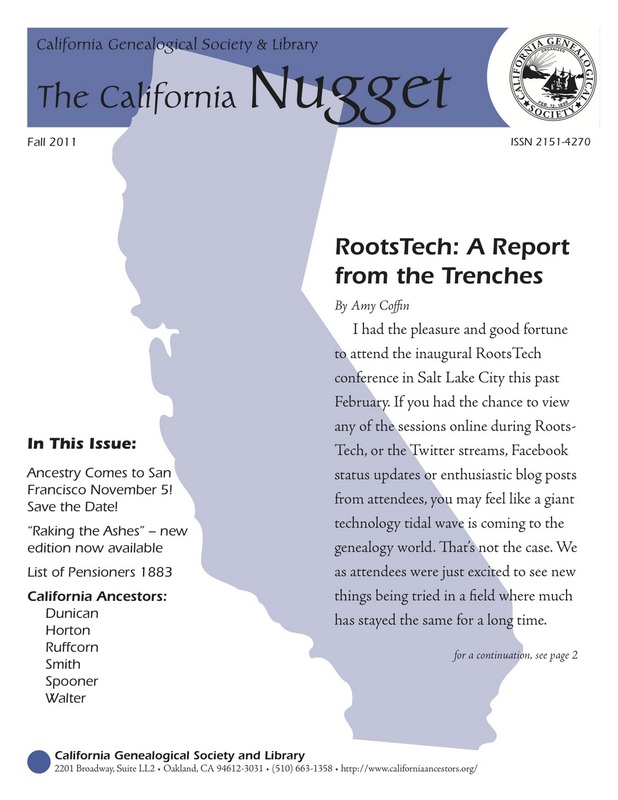 In other articles, Amy Coffin’s description of the first RootsTech Conference will take readers one step further into an exciting future where technology and genealogy meet. Rachel M. Popma, editor of Indiana Genealogist, has graciously allowed us to reprint her recent article that describes how to add eBay to your toolbox of genealogy search strategies. In “California Ancestors,” Jim Sorenson recounts the unexpected results of a persistent search to find just one more cousin. Virginia Turner looks back on early days of researching at CGS, and Sheri Fenley recounts the story of a successful pioneering family in San Francisco. One way to have your family’s history saved for posterity is to have it in print. Have you thought about submitting your family’s story to the Nugget? We are always looking for well-researched family histories as well as articles that will help our readers become better genealogists and more successful writers and researchers. 1883 Pensioners List: Cashman, James to Dorland, John M.
The California Nugget, the magazine of the California Genealogical Society, is published twice a year. Its purpose is to share the unique genealogical material in the CGS library, add to the body of family history information about Californians, offer guidance and timely information to family researchers, and to provide a forum for members to share their expertise and findings. Opinions expressed are not necessarily those of the society. The magazine is distributed free to members and is available to non- members for $5.00 an issue, plus postage. OMG! It is finally here and published? Mine has not yet arrived in the mail. Look Kathryn - there is my name after the title of an article in a print magazine! Thank you again for the opportunity to write for the Nugget. I hope to meet up with other society members at RootsTech 2012. Until then, I'll anxiously wait for my Nugget to make it to Texas.